Sri Lanka: Has ‘Katchchativu case’ become infructuous now? With the deaths of former Tamil Nadu chief ministers Jayalalithaa Jayaraman (AIADMK, December 2016) and M Karunanidhi (DMK, August 2018), the sensitive ‘Katchchativu case’ before the Indian Supreme Court and contesting the IMBL agreement between the two national governments might have become infructuous, as for as their personal involvement is concerned. This does not mean that the case cannot be revived, but then fresh cases may have to be filed by other stake-holders, including their respective parties. For now, the Tamil Nadu Government as an impleader in Jayalalithaa’s original petition also remains, but it needs to be taken forward, if it has to reach a final conclusion. This has come at an ‘inopportune’ moment for Indian fishers along the southern Tamil Nadu coast and Puducherry’s Karikkal enclave especially. Citing European Union (EU) mandate, Sri Lanka earlier this year increased by over 100 times the fine on foreign vessels to deter them from fishing in its water. At the early instance of TNA’s Tamil MP, M A Sumanthiran, followed up by the incumbent government, the Parliament approved amendments to the Foreign Fisheries Boats Regulation Act, 1979. Accordingly, foreign vessels violating Sri Lankan territorial waters have to pay a minimum fine of 4 million Sri Lankan Rupees and a maximum of 150 millions, based on the boats’ length, hence carrying capacity. The State Government, political parties and the fishing community in Tamil Nadu reacted strongly to the new Sri Lankan law, but to no avail. The subsequent arrests of Tamil Nadu fishers in Sri Lankan waters has meant that they have to spend longer time in prison, pending their court cases, which the host Government has often declined to withdraw, unlike in the past. In the meantime, the efforts of the Centre and the Tamil Nadu Governments for the Rameswaram fishers in particular to diversify to go in for deep-sea fishing has produced mixed results. The initiative was aimed at diversifying their produce-sources and variety. The Sri Lanka Navy’s mid-sea harassments and arrests, followed now by the stringent laws, added a new urgency for the governments and fishers in India to look at this alternative closely. The scope of deep-sea fishing is large, but the response has been modest until now. It is expected to pick up, with multiple pressures adding to the woes of the bottom-trawler owners along the coast. Bottom-trawling is banned under the law, so is the use of specific nets that are used in this form of fishing. These boats taking to coastal fishing has come in for massive protests from artisanal fishers, nearer home, leading to physical clashes, and loss of fishing for both, for days together. India and Sri Lanka drew a mutually-agreed IMBL (International Maritime Border Line) under UNCLOS-I (UN Law of the Seas) through bilateral agreements in 1974 and 1976. The two sides did not follow the normal ‘median line’ principle while drawing the IMBL. This meant that Katchchativu islet fell on the Sri Lankan side of the IMBL. The two nations got the agreement promptly notified under UNCLOS-I. This remains irreversible unless either of the national Governments seeks to reopen the case. 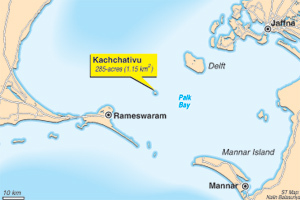 Despite political changes at the national-level over the past nearly three decades, New Delhi has reiterated its position that Katchchativu now belonged to Sri Lanka. Political parties and some academics in Tamil Nadu have often pointed to the removal of a clause in the 1974 agreement. Under this clause, Indian fishers could dry their nets on Katchchativu. This clause does not find a place in the 1976 accord. In recent times, the Sri Lankan side has argued that unlike in the past, the present-day nets were made of nylon, not cotton. Hence, there was no need to dry them. The implication is also that Indian fishers had only a ‘limited right’ to dry their nets on the islet, and there never ever was any right for them to fish in those waters, as was/is being argued by the Indian fishers and their backers. Jayalalithaa first agitated the issue before the Supreme Court in her ‘personal capacity’. Her AIADMK was in the Opposition at that time. Karunanidhi joined in later, after losing power, and through a separate petition. After Jayalalithaa’s return to power in 2011, the Tamil Nadu Government enjoined itself as a party to the case, and also took a line akin to hers. The argument by all three petitioners related to the constitutional provision empowering the Union of India to re-define the nation’s borders. The law empowers Parliament to alter international borders through a resolution, requiring only a simple majority. This was done. The Centre has continuously has said that the IMBL was never demarcated earlier. Hence, there was no question of alienating Indian territory, Parliament was told. What was done in 1974 was only to define and draw the IMBL for the first time ever. Both Jayalalithaa and Karunanidhi argued in their SC petitions that there was enough evidence and records to show that Katchchativu belonged to India under the British Raj, and even earlier. Giving it away to Sri Lanka was ‘alienation’, and the Centre did not have the inherent powers to pledge ‘national sovereignty’ and ‘territorial integrity’. Larger questions are said to be involved in the IMBL demarcation. The bilateral decision and the UNCLOS notification have possibly ensured that the Palk Straits remains the ‘internal waters of sorts’ India and Sri Lanka, with no scope for third nations to claim ‘right to passage’ under the UNCLOS and other international laws. There is no scope for third-nation maritime/naval presence in these waters, as at present. As may be recalled, when India took up the now-litigated Sethusamudram Project, the US, for instance, declared that if the waters were to be opened for maritime traffic going beyond shipping, the American navy would seek to access it. The project was conceived as a cheaper alternative to the East-West-East coastal maritime traffic in India having to circumnavigating Sri Lanka. A security angle offered itself with talks of China coming to work on the Hambantota Port project in Sri Lanka’s south, facing the Indian maritime trade. Today, China is very much there, and as a 99-year-lessee to the Hambantota ‘real estate’. The alternative ‘American proposition/threat’ in the matter did not present itself as much serious as China’s possible and near-permanent presence when the Centre launched the Sethu project. If there were issues on either score, they have not been agitated in the ‘Sethusamduram case’, which is also before the Supreme Court for years now. There, it has been argued mostly on matters of religious faith, of the majority Hindu community in the country. Accordingly, sea-embedded rocks on the water are remnants of the ‘land-bridge’ that an ‘army of monkey’s (‘vanar sena’) laid for Lord Ram to cross over the mythological Lanka, to free his wife, Sita, back, from the rakshas ruler Ravanan, who had taken her away. Arguments before the Supreme Court for reviving the work on the Sethu project have centred on finding an alternate route-alignment to the one cleared by the Centre earlier. The court cannot be seen as going into security issues of geo-strategic importance which are in the exclusive purview of the Executive. Oftentimes, Governments at the Centre have kept it all a closely-guarded secret, and does not share all details with State Governments concerned or with Parliament. The reasons are obvious, justified and justifiable. Yet, the Centre may have to revisit the two cases and take positions that derive from common roots and concerns, where national security does not get compromised at any cost. At the same time, such propositions should not alienate the ‘sensitive Tamil sentiments’ in the southern State, more than already – that too in an ‘election year’, as it is now.